Happy Hour By the Bar 4 PM- 6 PM Monday to Friday. 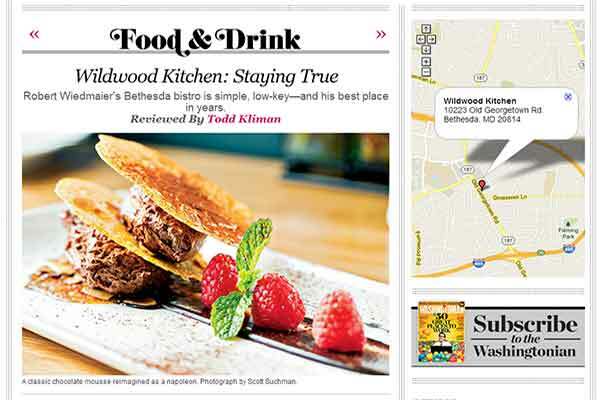 Located in Bethesda's Wildwood Shopping Center, Wildwood Kitchen is a totally new concept for Chef Robert Wiedmaier. As the sixth restaurant within his award-winning portfolio, the local bistro offers unique, modern cuisine influenced by the 23 countries surrounding the Mediterranean - an area distinctly south of the Franco-Belgian territory with which Wiedmaier is normally associated. Its emphasis on coastal offerings, exotic spices and farm-fresh vegetables cooked with little butter or cream reflects the healthful diet of southern Europe and is bolstered by a strong wine program and classic cocktail offerings. 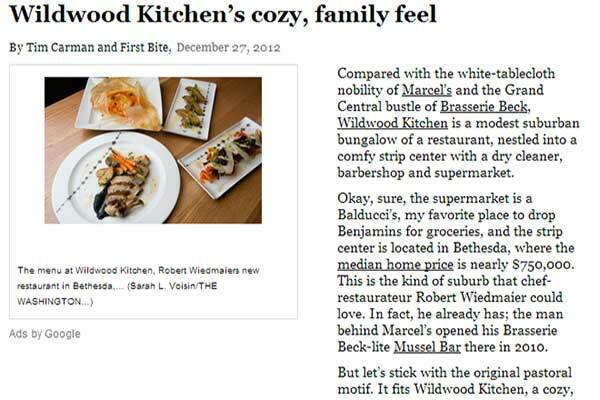 Wildwood Kitchen offers a selective menu of eight appetizers, eight entrées and artisanal charcuterie and cheese selections. Appetizers and entrees range from English Pea Agnolotti with Ricotta Salata and Nigella Seeds, to Slow Braised Lamb Meatballs with Potato Purée, Harissa and Shaved Rocca, and Tangier Spiced Duck Breast with Medjool Dates, Yellow Lentils and Burnt Orange Gastrique. 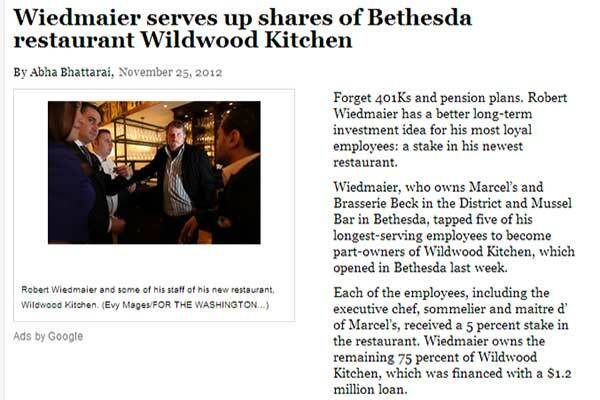 Robert Wiedmaier's Bethesda bistro is simple, low-key - and his best place in years. 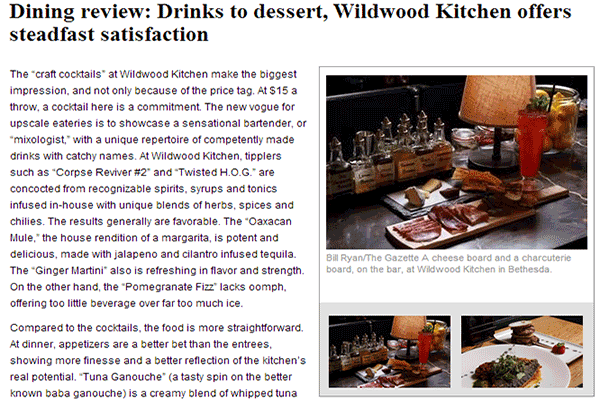 Wildwood Kitchen provides a welcome retreat, with a menu of (somewhat) healthier choices and plenty of ambience. Note: Please do not submit reservation requests through our online contact form. 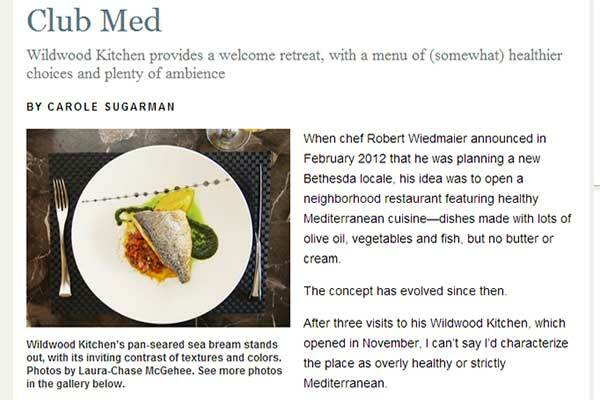 © 2019 RW Restaurant Group. All Rights Reserved. We get information about you in a range of ways. Information You Give Us. We collect your‎ name,‎ email address, and other information you directly give us on our Site. Information We Get from Others. We may get information about you from other sources. We may add this to information we get from this Site. Information Automatically Collected. We automatically log information about you and your computer. For example, when visiting our Site, we log‎ your computer operating system type,‎ browser type,‎ browser language,‎ the website you visited before browsing to our Site,‎ pages you viewed,‎ how long you spent on a page,‎ access times,‎ Internet protocol (IP) address, and information about your use of and actions on our Site. Web Beacons. We may log information using digital images called Web beacons on our Site or in our emails. We use Web beacons to manage cookies, count visits, and to learn what marketing works and what does not. We also use Web Beacons to tell if you open or act on our emails. ● We use your personal information to respond to comments and questions and provide customer service. We may share personal information with your consent. For example, you may let us share personal information with others for their own marketing uses. Those uses will be subject to their privacy policies. We may share personal information when we do a business deal, or negotiate a business deal, involving the sale or transfer of all or a part of our business or assets. These deals can include any merger, financing, acquisition, or bankruptcy transaction or proceeding. We may share personal information for legal, protection, and safety purposes. We may share information to comply with laws. We may share information to respond to lawful requests and legal processes. We may share information in an emergency. This includes protecting the safety of our employees and agents, our customers, or any person. We may share information with those who need it to do work for us. We may also share aggregated and/or anonymized data with others for their own uses. Our marketing emails tell you how to "opt-out." If you opt out, we may still send you non-marketing emails. Non-marketing emails include emails about your accounts and our business dealings with you. You may send requests about personal information to our Contact Information below. You can request to change contact choices, opt-out of our sharing with others, and update your personal information. You can typically remove and reject cookies from our Site with your browser settings. Many browsers are set to accept cookies until you change your settings. If you remove or reject our cookies, it could affect how our Site works for you. SECURITY OF YOUR PERSONAL INFORMATION. We take steps to help protect personal information. No company can fully prevent security risks, however. Mistakes may happen. Bad actors may defeat even the best safeguards. Menu items, offerings, prices, subject to change without notice.